Talk Nerdy To Me: iPad 2- 101, Should You Purchase? iPad 2- 101, Should You Purchase? Lets close this iPad launch weekend out with one last post! I wanted to create a post specifically for non-techies that are both interested in learning some cool iPad stats and/or are interested in purchasing an iPad. I know the world of tech can be an overwhelming one and I've been getting a lot of questions so allow me to break it down for you! I’ve put a lot of basic information in here but if you still have questions feel free to ask away! Analysts predict that launch day sales will nearly double this year to almost 600,000. What are the upgrades in the new model? § The iPad 2 is essentially a better product but it still costs the same. § It comes in both black and white. o If you want you can automatically publish videos to YouTube, Facebook, CNNiReport (:-D), share via email or just save to your iPad. § Apps: iMovie and Garage Band – create your own mini movies and music pieces with virtual instruments. I’m kinda interested in the iPad 2 should I wait or should I buy? In short, bite the bullet. You won’t be disappointed. And don’t wait for any discounts. One thing to know about Apple – they don’t offer deals. You aren’t going to find a coupon either. Sometimes around back to school time they will pair something like an iPod Touch (think of it as a mini iPad) with a laptop. Also, Apple is typically on a 12-month product cycle. Since the iPad JUST came out – you’re good to buy one now! *Caveat- There have been rumors of an iPad3 in October – this would break that rule but I truly think anyone is in good hands with this version! I’m not sure if I really need it? As a tech expert I hear this a lot. Here’s the deal – I understand how people can be overwhelmed by technology these days. There is an influx of gadgets and let me be the first to tell you – there’s a lot of unnecessary ones on the market that you don’t need. However, the iPad is one of my top three musts. There is something incredibly accessible about it. I pretty much carry mine with me everywhere. I have access to internet and email all the time and I love the apps. I also like that I can swap my heavy laptop for it for a 2-3 day trip! And the big thing is its not just for power users like myself. My mom who isn’t overly tech savvy asked if she could play with one of mine (yes I shamelessly have a few!) She never asked me how to use it it was just that intuitive, and then she kept it. She loves it for the email, internet and some of the apps (especially the ones she can play with my 2 year old niece) She also uses it for iBooks. I bought her a Nook Color (e-reader) which I thought would be easier for her and she much prefers the iPad because she can read her books (change the font size, zoom in and out with the pinch of a finger). After playing with the iPad after the Nook Color she didn’t understand why anyone would want and or pay for the Nook Color over the iPad since it has everything all in one – I thought that was pretty funny. You have the choice of having the wireless only version - which as it says you can access the internet anywhere you are in a hotspot – or the 3G option which basically uses AT&T or Verizon to give you internet access anywhere, anytime. I think it’s worth having the 3G. And since you have to make that purchase upfront you might as well. There is no long-term contract for AT&T and Verizon service which I find awesome. So if you don’t end up using it, get rid of it for a few months. If you are traveling for a week down the road you could get it for a month – it will pay for itself in lieu of hotel wi-fi. Buy the 2GB larger size and then see at the end of two months how much you are using … you can drop to the $14.99 250MB if you need to. If you are a light user you wont need the 2GB most likely – I just would play it safe the first month! If you want to go the Verizon route monitor your data! There are more tiered options on the Verizon side and you don't want to get overcharged. Regular User: Average amount of downloads, email, web, apps, etc. *Also make sure you are in a good coverage area for AT&T – if not … pick Verizon! Do I need any extras? Smart Cover. I recommend getting one of the $39 smart covers Apple just unveiled. They are pretty nifty and use magnets to snap right on to the device to protect the screen. Plus when they cover the screen it puts the tablet in sleep mode. If you want to go fancy you can get a $69 leather one. 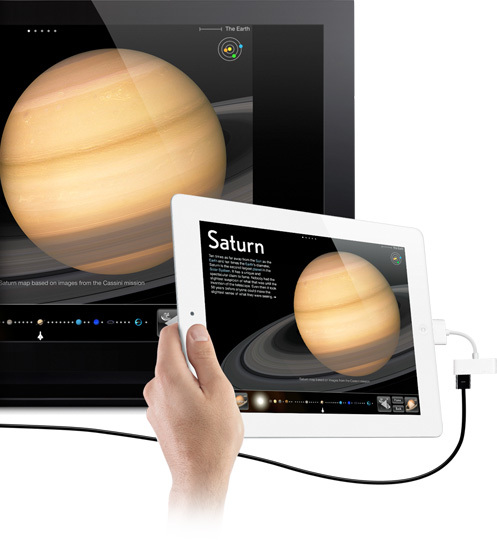 If you have any interest in hooking your iPad up to a TV (maybe you want to show off pictures in your living room right on your flatscreen or you are a teacher with the capability to share educational apps with a classroom) you can take advantage of much larger output. You’ll need the HDMI adaptor $39 and an HDMI cord. *Tip – never buy an HDMI cord in store – buy online from somewhere like Amazon.com for a fraction of the price! I don’t think you need this right away. Try out the on-screen keyboard first and see if it drives you nuts. I personally like a separate keyboard but its really personal preference. There are some keyboard options found here. I am sure you have heard a lot about apps. There are over 350,000 in the app marketplace and over 65,000 made specifically for the iPad. Feel free to start downloading most are free to $0.99 – you’ll quickly get the novelty of them but also will enjoy apps like CNN that always keep you posted. Just think – your iPad can turn into a virtual newspaper that always keeps you informed and is constantly being updated! There are a number of dock options at various prices. It is definitely a want not a need. 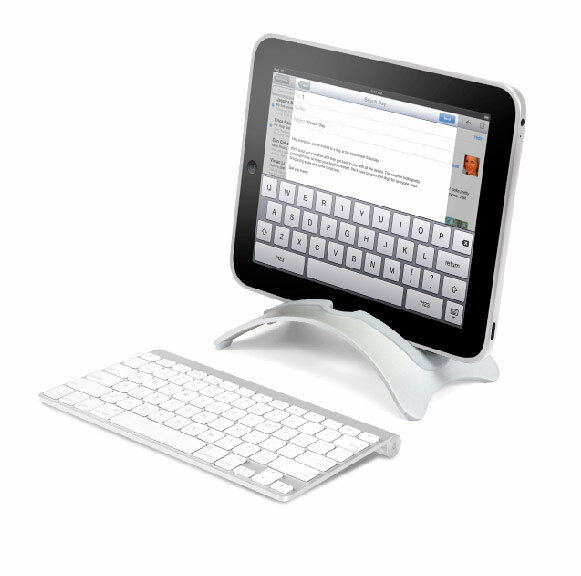 But a need if you want to pair it smartly with a Bluetooth keyboard. I have a few including the Book Arc and the Griffin A Frame Stand. Mashable.com does a good job compiling a bunch of options. Click here for more. Is there another tablet on the market I should consider? In short, no. I have had my hands on every “only competitor to the iPad”. From the 7” Galaxy Tab to the Motorola Xoom and no competition (in my opinion) can hit the usability or pricepoint. And note that the competition is dying on the price of this new version. What if you have an older model and want to upgrade -- can you trade in? Gazelle.com is a leading site for trading in your old models for cash. So if you have an old gadget from a cell phone to an mp3 player I recommend this site as a reputable place to cash in. They send you a check in about a week. Gazelle's Director of Marketing Kristina Kennedy shared that they surpassed 10,000 trades on Friday, making it the highest quantity of any product traded in as part of an upgrade and the largest reCommerce event EVER. Pricing on trade-ins remains steady between $300-530 depending on model and condition. Most are coming in at the high end (still about 92-93% perfect condition) and our current offer is about $425. An interesting note – Apple offers free engraving when you purchase an iPad2. According to Kristina, if you ever want to upgrade engraving could drop the resale price by as much as 20%-30%. Something to think about. I have a laptop -- does this replace it or compliment it – are tablets where we're going? For portability and on-the-go connectivity I think this is a gadget that makes a lot of sense in addition to having a powerful laptop. It’s really becoming a one two punch. After all, there is a reason why 15 million of these were sold in 9 short months. If you recall netbooks were a hit a couple of years ago and now are on the decline. Netbooks to me were never powerful enough to stick around not to mention were awkward in size hands on. Tablets however, I feel are becoming that must have secondary gadget for all sorts of users. I do think we are seeing the death of the desktop PC. Thank you for the wonderful post, Katie! I was already on board with the iPad 2 but this sort of sealed the deal even more. Can't wait! nice! glad to hear Amanda :) you will love! nice iPad post! i have a white verizon version that should be here tuesday! i'm super excited to get it.. i had the xoom for a week in our store and it just wasn't what it needs to be to compete in my opinion!